Petrol, diesel or LPG? This argument has been going on since Moses converted his Series 2 Landie to LPG and got crucified as a heretic. The only comment I’ll make here is that, although it’s improving all the time, LPG is still hard to find in really remote areas and unfortunately can’t be carried in tanks or jerry cans. The very thing we love about Outback touring – the remoteness – means that to travel into these areas is to be entirely self-sufficient. Service stations are typically hundreds and hundreds of kilometres apart, and being able cover that distance means the need for a large fuel carrying capacity. 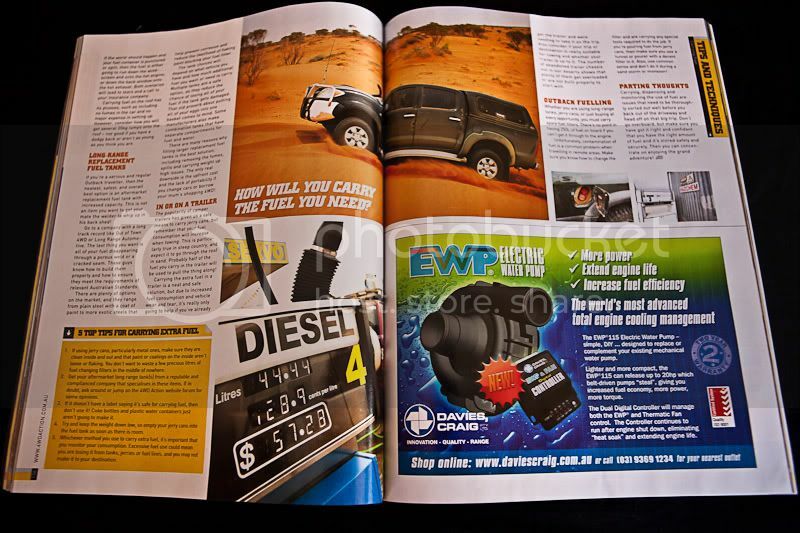 Add in a safety margin for those emergencies where fuel isn’t where you think it will be, and it’s easy to see that just about every 4WD on the market requires an additional fuel carrying capacity. The question, then, is how do you store it? It’s hard enough for the first time remote area traveller with a plan of heading out into the great unknown, without all of the support services we take for granted around town. It’s easy to be overly conservative and end up with two tonnes of gear on board, either breaking the vehicle or getting bogged at every second dune. This is especially true with fuel. You need enough for the trip, plus a safety margin, but not so much that you need HAZCHEM logos on the back of your fourby and a tanker drivers licence! A diesel wagon, fully loaded with gear but not towing, is going to use at least 20L/100km. 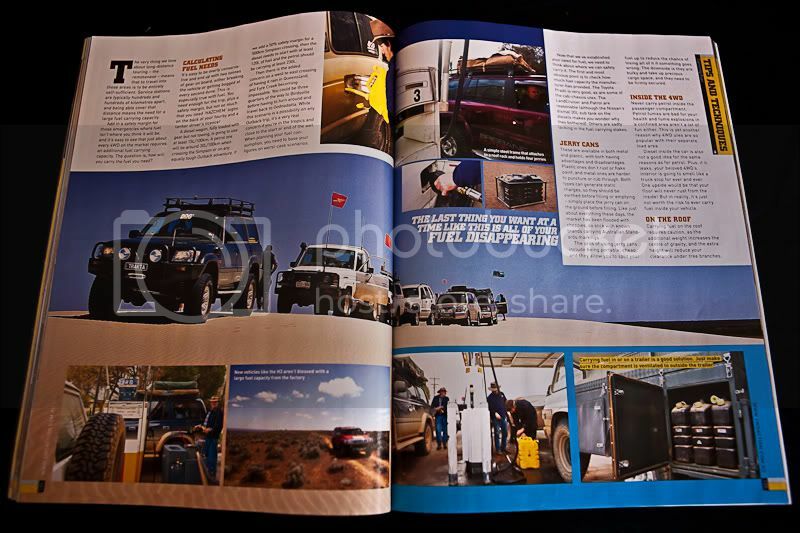 A petrol one will be around 30L/100km when crossing the Simpson or on any similar sandy Outback adventure. If we add a 50% safety margin for a 500km Simpson crossing, then the diesel needs to start with at least 150L of fuel and the petrol should be carrying at least 230L. Then there is the added concern on a west to east crossing of having it rain in Queensland, and Eyre Creek becoming impassable. You could be are three quarters of the way to Birdsville, before having to turn around and travel back to Oodnadatta. This scenario is typical for many Outback treks, and is the reason why a first timer can end up carrying excessive amounts of fuel. Be safe but also be realistic and ask around for other peoples experiences in similar vehicles on similar trips. Now that we’ve established your need for lots of fuel, we need to look into where we can safely carry it. The first and most obvious point is to check how much fuel capacity the manufacturer has provided. The Toyota Prado is very good, as are some of the cab chassis utes. LandCruiser and Patrol are reasonable (although the Nissan’s dismal 30L sub tank on the diesels makes you wonder why they bothered). Others are sadly lacking in the fuel carrying stakes. These are available in both metal and plastic, with both having advantages and disadvantages. Plastic ones don’t rust or flake paint, and metal ones are harder to puncture or rub through. Both types can generate static charges so should be earthed before filling or emptying – simply place the jerry can on the ground before filling. Like just about everything these days, the market has been flooded with cheapies so stick with known brands carrying Australian Standards markings. Pros of using jerry cans include being portable, cheap and they allow you to split your fuel up to reduce the chance of losing all of it if something goes wrong. The downside is they are bulky and take up precious cargo space, and they need to be firmly secured. Never carry petrol inside the passenger compartment. Petrol fumes are bad for your health and fume explosions in a confined area aren’t a lot of fun either. This is yet another reason why 4WD utes are so popular with their separate load area. Diesel inside the car is also not a good idea for the same reasons as for petrol. Plus, if it leaks your beloved 4WDs interior is going to smell like a truck stop for ever and ever. One upside would be that your floor will never rust from the inside! But in reality, it’s just not worth the risk to ever carry fuel inside your vehicle. Carrying fuel on the roof requires caution as the additional weight increases the centre of gravity, and the extra height will reduce your clearance under tree branches. If the worst should happen and your fuel container is punctured or split, then the fuel is either going to run down the windscreen and onto the hot engine, or down the back window onto the hot exhaust. Both scenarios will lead to tears and a call to your insurance company. Carrying fuel on the roof has its plusses, such as including no fumes in the car and no major expense in setting up. However, consider how you will get several 20kg lumps onto the roof – not good if you have a dodgy back or aren’t as young as you think you are. 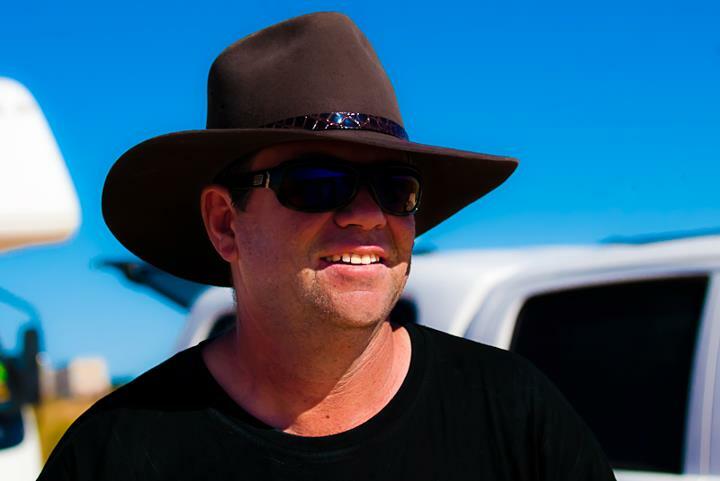 If you’re a serious and regular Outback traveller then the neatest, safest and overall best option is an aftermarket replacement fuel tank with increased capacity. This is not an item you want to get your mate the welder to whip up in his back shed! Go to a company with a long track record like Out of Town 4WD or Long Range Automotive. The last thing you want is all of your fuel disappearing through a porous weld or a cracked seam. These guys know how to build them properly and how to ensure they meet the requirements of relevant Australian Standards. There are plenty of options on the market and they range from plain steel with a coat of paint to more exotic steels that help prevent corrosion and reduce the likelihood of flaking paint blocking your fuel filter. The tank choices will depend on what vehicle you have and how much additional fuel you want or need to carry. Multiple tanks are a safe option as they reduce the chance of losing all of your fuel if the tank gets damaged. That old proverb about putting all of your eggs into one basket comes to mind. Some manufacturers also make combination tanks that have separate compartments for fuel and water. There are many reasons why fitting larger replacement fuel tanks are the best solution, including removing the fumes, spills and carrying weight up high issues. The only real downside is the upfront cost and the lack of portability if you change cars or borrow your mums shopping 4WD! The popularity of camper trailers has given us a safe means to carry jerry cans, but remember that your fuel consumption will increase when towing. This is particularly true in steep country, and expect it to go through the roof in sand. Probably half of the fuel you carry in the trailer will be used to pull the thing along! Carrying the extra fuel in a trailer is a neat and safe solution, but due to increased fuel consumption and vehicle wear and tear it’s really only going to help if you’ve already got the trailer and were needing to take it on the trip. Also consider if your trip or destination is really suitable for towing and whether your trailer is up to it. The number of abandoned trailer chassis out in our deserts show that plenty of them get overloaded or are not built properly to start with. Whether you are using long range tanks, jerry cans or just buying at every opportunity you MUST carry spare fuel filters. There’s no point in having 250L of fuel on board if you can’t get it through to the engine. Unfortunately contamination of fuel is a common problem when travelling in remote areas. Make sure you know how to change the filter and are carrying any special tools required to do the job. If you’re pouring fuel from jerry cans then make sure you use a funnel or pourer with a decent filter in it. Also, use common sense and don’t do it during a sand storm or monsoon! Carrying, dispensing and monitoring the use of fuel are issues that need to be thoroughly sorted out well before you back out of the driveway and head off on that big trip. Don’t go overboard but make sure you have got it right and confident that you have the right amount of fuel and it’s stored safely and securely. Then you can concentrate on enjoying the grand adventure! 1. If using jerry cans, particularly metal ones, make sure they are clean inside and out and that paint or coatings on the inside aren’t loose or flaking. You don’t want to waste a few precious litres of fuel changing filters in the middle of nowhere. 2. Get your Aftermarket Long Range tank(s) from a reputable and complianced Company that specialises in these items. 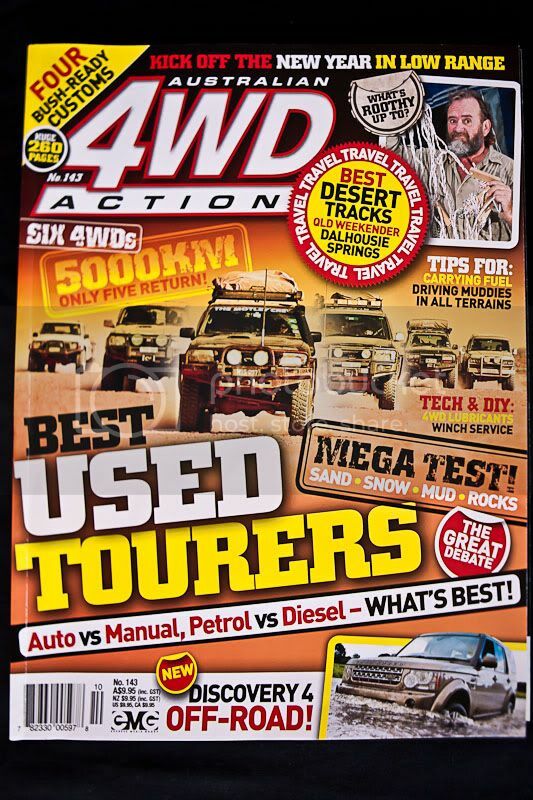 If in doubt ask around or jump on the 4WD Action website Forum for some opinions. 3. If it doesn’t have a label saying it’s safe for carrying fuel then don’t use it! Coke bottles and plastic water containers just aren’t going to make it. 4. 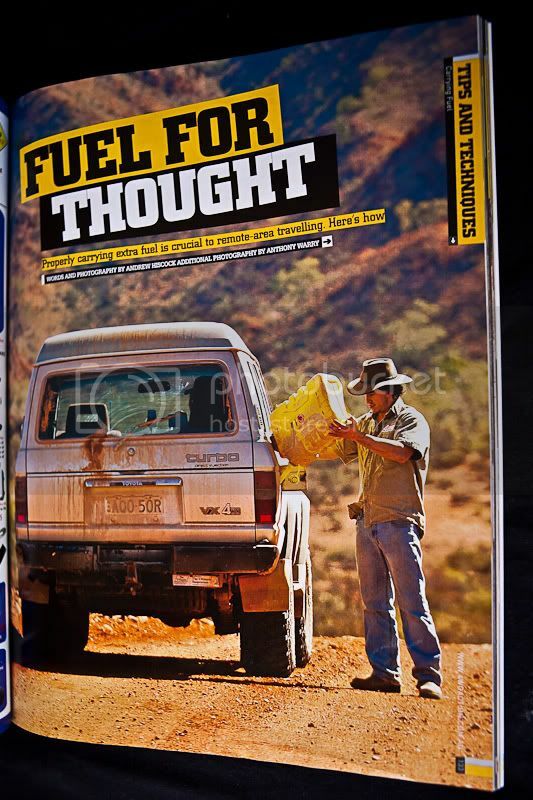 Try and keep the weight down low so empty your jerry cans into the fuel tank as soon as there is room. 5. Whichever method you use to carry extra fuel it’s important that you monitor your consumption. Excessive fuel use could mean you are losing it from tanks, jerries or fuel lines and you may not make it to your destination. Great thoughts from this blog. Very helpful information.